Friday, November 17, 2017 - The Transgender Day of Remembrance was founded in 1998 by transgender activist Gwendolyn Ann Smith to memorialize Rita Hester, a transgender murder victim in Allston, Massachusetts. Transgender Day of Remembrance commemorations are now being held across Florida, and in more than 200 cities and 25 countries around the world. At TransAction Florida, we believe that despite the challenges that face our community, we must be visible voices for transgender equality. Visibility fosters awareness that inspires education and results in equality. “Since marriage equality has come to our country, we have seen the crosshairs of discrimination aimed squarely on the transgender and gender nonconforming community. Alarming rates of transgender bullying, harassment, violence and murder are occurring across America,” said Gina Duncan, Equality Florida’s Director of Transgender Equality. In 2015 a transgender person was reported murdered every three days somewhere in the world. Already this year, in the United States, 25 transgender people, mostly transwomen of color, have been reported murdered. “In the dark shadow of the Pulse massacre, the Transgender Day of Remembrance and Visibility is a time to pause, reflect and together, renounce violence against our community. Let us remember those who have experienced harm for simply trying to live an authentic life, but, let us also stand together, committed to the power of visibility, and education that is leading to increased awareness and inclusion of the transgender community. Transgender Floridians are parents, husbands, wives, aunts, uncles, siblings, neighbors and community leaders. 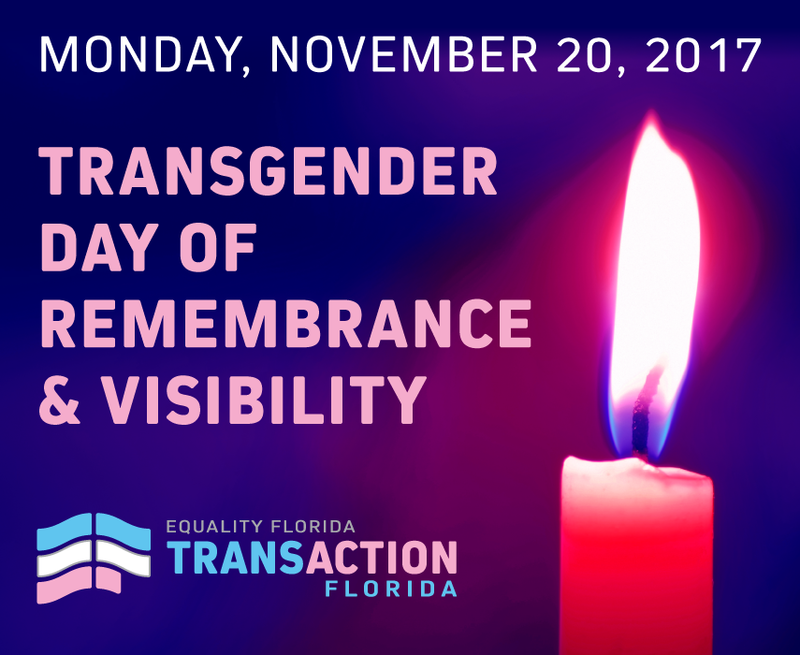 With that in mind, Equality Florida invites you to support the Transgender Day of Remembrance and VISIBILITY events on November 20th as we acknowledge November as Transgender Awareness Month,” added Duncan.